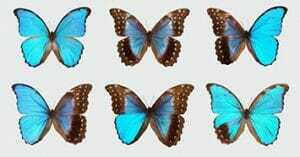 DSK is proud to be working with Dr.Patel and his team to design a Butterfly Vivarium at the University of Chicago’s Marine Biological Laboratory. An article on Dr.Patel’s work has been featured in the New York Times. DSK is thrilled to announce that we have been selected to design the addition & renovation of Lilly Library at Duke University! The project aims to reinvigorate East Campus and breathe new life into Lilly as an academic hub – both retaining the charm of the beloved original library, and the addition of dynamic new collaborative spaces. 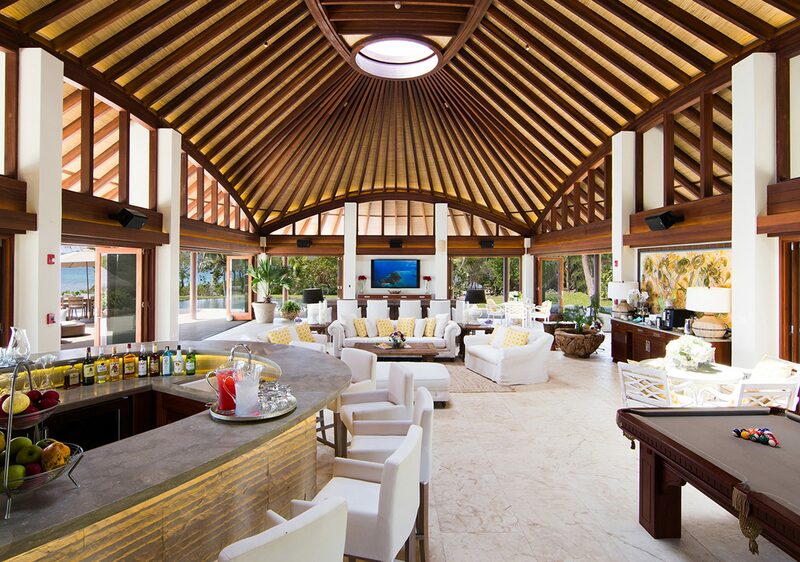 Following the destruction of Hurricane Irma, DSK has been working to restore many of the buildings on Necker Island in the British Virgin Islands. The Necker Island Projects include several guest houses, dining & recreational pavilions, and the reconstruction of the Necker Great House. More information about the projects can be found here and also in this recent article written by the Robb Report. Image courtesy of Virgin Limited Edition. From all of us at DSK, we hope that you have a wonderful holiday season. 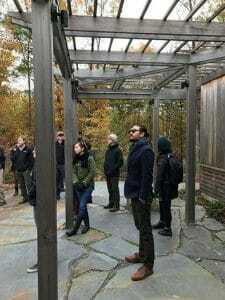 In October, the DSK team took advantage of a beautiful New England fall day (and a recently completed project) and transformed their usual Bi-annual meeting into a mindfulness retreat. The Summer Star Wildlife Sanctuary, located in Boylston, is a place of tranquility and self-reflection whose mission is to protect and care for the wildlife that thrives in this 45-acre habitat of natural land, plants, streams, and glacial boulders. The DSK team gathered at the trailhead house to experience first hand how design and nature comes together to create a place of reflection. 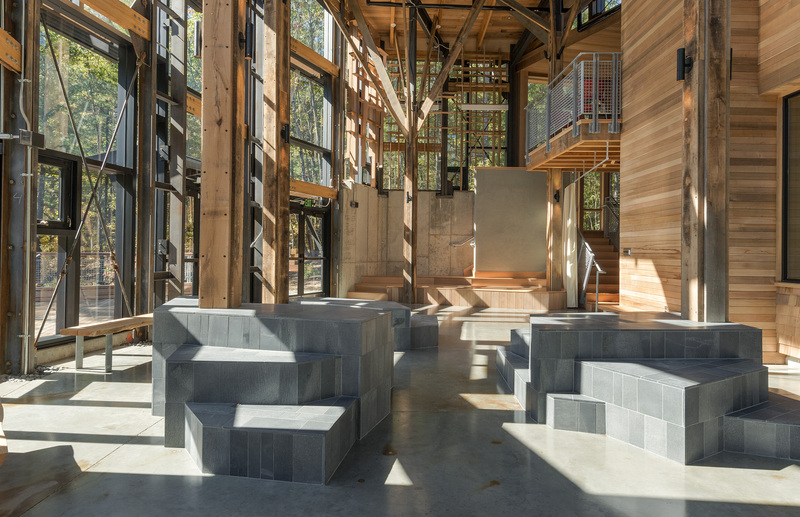 With a LEED Gold certification the building is the front door for the visitors of the sanctuary. Lunch, a moment for mindfulness (led by Lara Wilson – Be Well Be Here), and then a short hike in the woods rounded out the Bi-Annual meeting for the DSK team. We are pleased to announce that leading architect, Leila R. Kamal, AIA, LEED AP, has joined DSK Architects + Planners as Principal and Vice President. 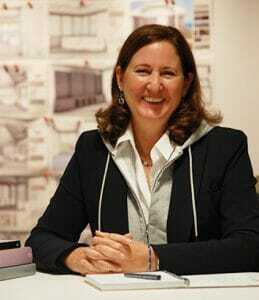 Leila comes to DSK from EYP Architecture and Engineering, where for the past 20 years, she served as Principal, Chief Design Strategy Officer, and Board member. With her experience and her passion for design, Leila is excited to contribute to DSK’s diverse portfolio and culture. 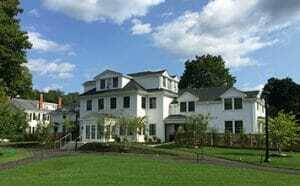 The Bradford House additions and renovations at Concord Academy are finally complete and are ready for the upcoming school year. The addition includes a new student common room, new dorm rooms and two new faculty apartments while the renovations feature refurbished interior student and faculty spaces as well as a fully restored historic decorative staircase. On the other end of the campus, construction has begun on a new addition that links Haines House and Hobson House together with new student common rooms and faculty apartment spaces. 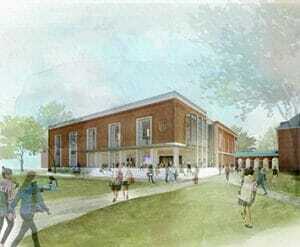 Officially known as the Haines Hobson Commons, this project is set to be completed for the 2019 school year. DSK’s Somerville Studio has moved to Concord effective July 23rd. DSK merged with KDG last year and we are now under one roof in a newly expanded Concord Studio. 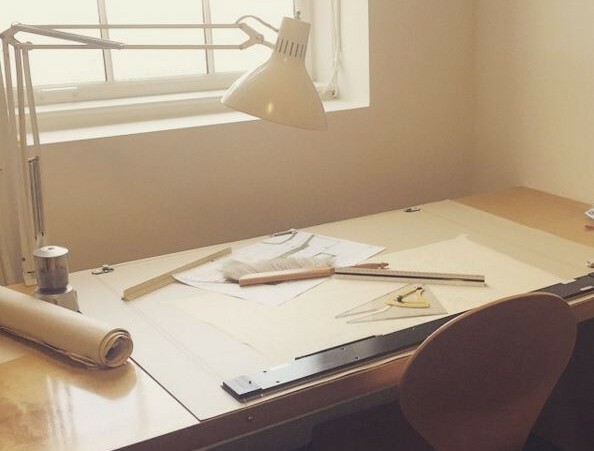 Our new studio houses additional collaboration space, the Materials Lab, a model-making shop, and flexible work space for members of our design team. Incorporating a variety of products DSK uses on many projects, our studio doubles as a showroom for our clients. 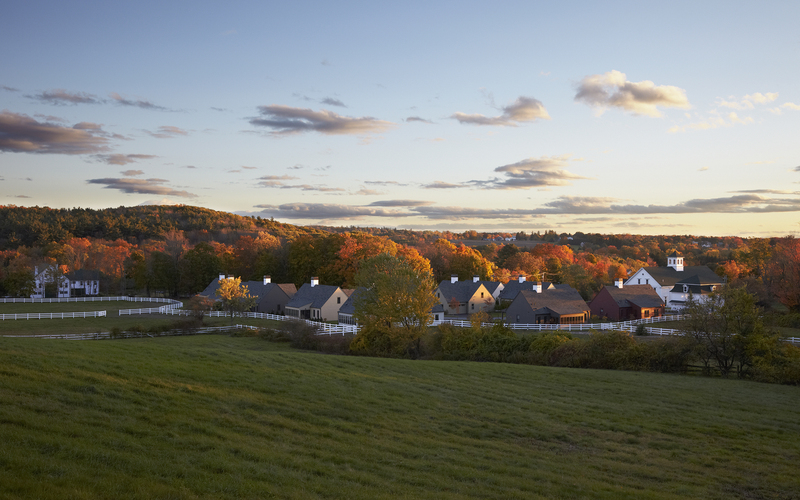 DSK’s South Dartmouth office continues to serve our South Coast and Southern New England clients. 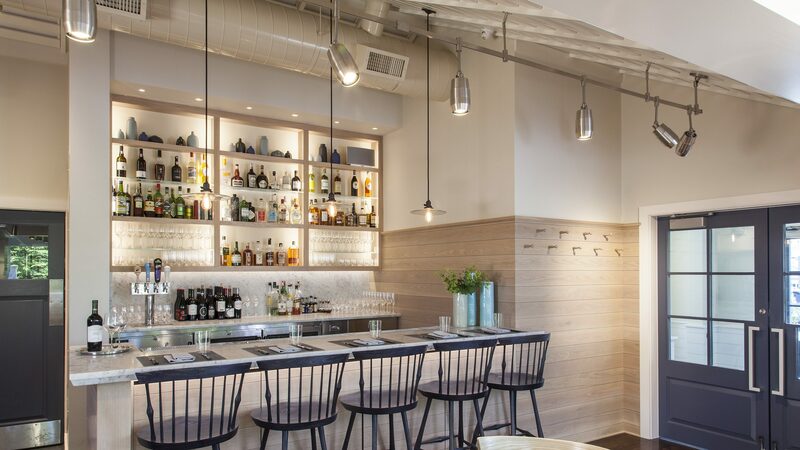 Developing rich color schemes, coordinating patterns, and alternating textures is a process that DSK | Interiors enjoys. 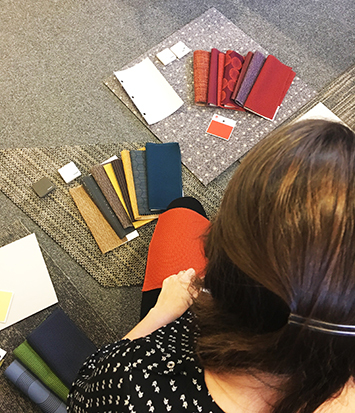 Pictured here, Haley creates a palette of materials for the CA Houses project that kicks off this summer. 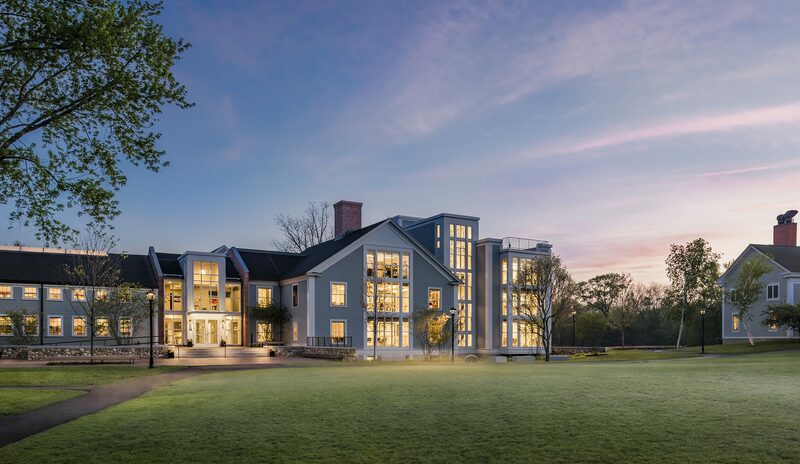 The new Haines-Hobson Commons will connect two of the oldest houses on Concord Academy’s campus, creating space for students to gather and collaborate outside of the classroom. The careful coordination of materials allows for a seamless integration of these two historic and architecturally distinct houses. Whether its carpets, fabrics, or window treatments, the Interiors team assures the design is cohesive, down to the tiniest detail. Sky Milner’s work with the MIT Urban Risk Lab is currently on display in the Japan Pavilion of the 16th Venice Biennale, an international architecture exhibition. The 2013 Sanriku Project looks at single-use commercial areas slated to be raised 10 meters above sea level in Minami Sanriku after the 2011 Tohoku earthquake and tsunami. Sky’s planning watercolors of post-disaster Minami Sanriku documents the memories, concerns, and hopes for the future of those affected in an effort to increase communication between office and grass-roots planning efforts. 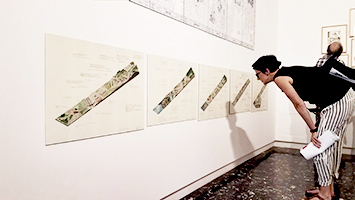 The Pavilion show titled ‘Architectural Ethnography’ includes drawings from 42 architectural practices who use drawing in new ways to engage communities. 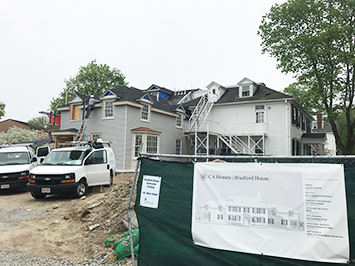 Construction continues at the Concord Academy Bradford House as part of residential life enhancements outlined in The Centennial Plan for Concord Academy. The west and north wings are almost complete. In June interior renovations will start on the east and south wings and be completed by late summer. During conceptual design a parti sketch (bottom) helps DSK designers define an idea. The construction photo (top) shows how the idea is being translated into a built work. Stay tuned for progress on this modern house tucked into the woods of Carlisle. 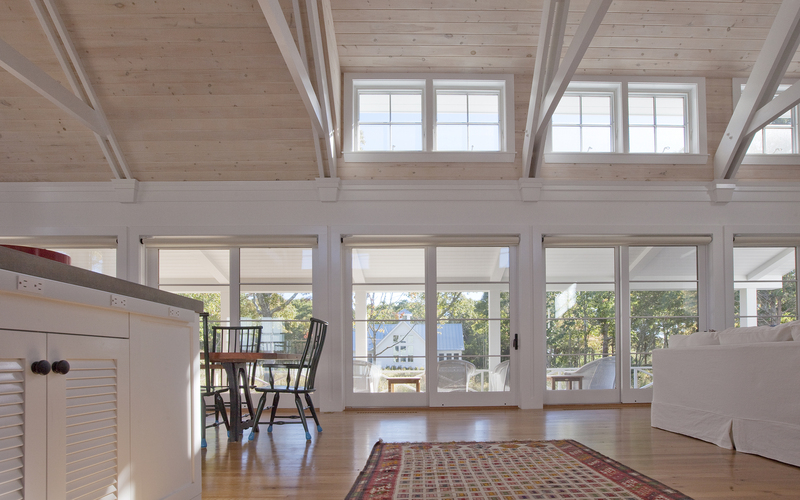 New photos of our Westport project, Turtle Rock Farm, are up! Click through the photos here to see more of this one-of-a-kind house. 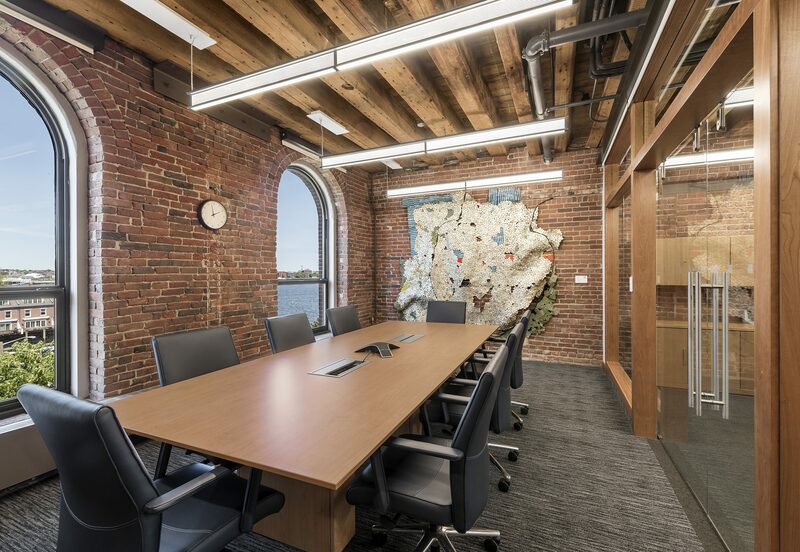 Learn why DSK jumped at the chance to bring Kao Design Group (KDG) into the fold, what it means for the future of our newly combined practice, and what legacy clients of each firm can look forward to. No amount of snow can stop Concord Market from forging ahead! 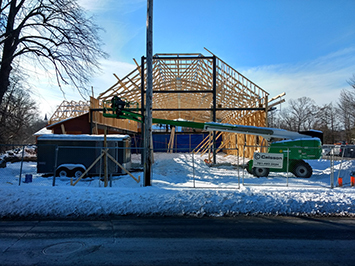 This project’s wood framed structure continues to progress, even when surrounded by 14 inches of snow. Concord Market is set to be completed late summer and will be a great asset to the community! Every unique stair deserves the right light. For important statement pieces, DSK | Interiors will first create a replica of the piece in Revit and then build a full-scale mock up to test during construction. The life-sized model ensures the object and its intended placement are right for the space. 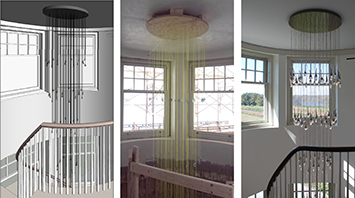 The photo below illustrates the process from Revit, to the life-sized model made of washers and string, and finishing with th­­­e final piece: the Ochre Seed Cloud Round 112 Buds. 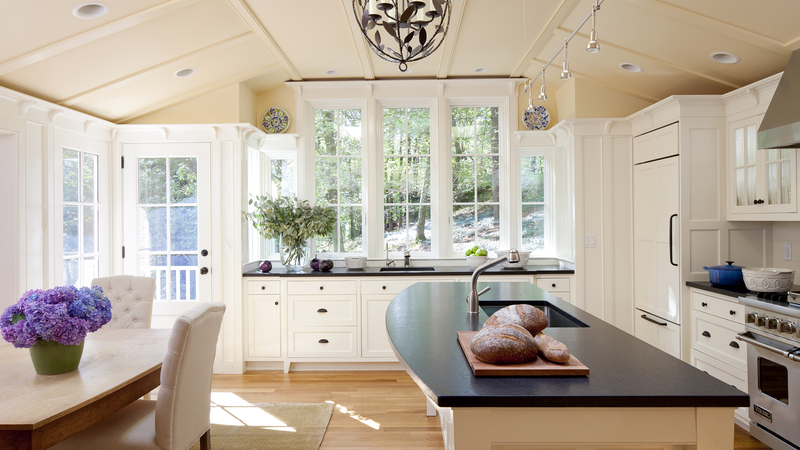 The careful attention paid to this spectacular pendant makes it a great addition to this one of a kind house. 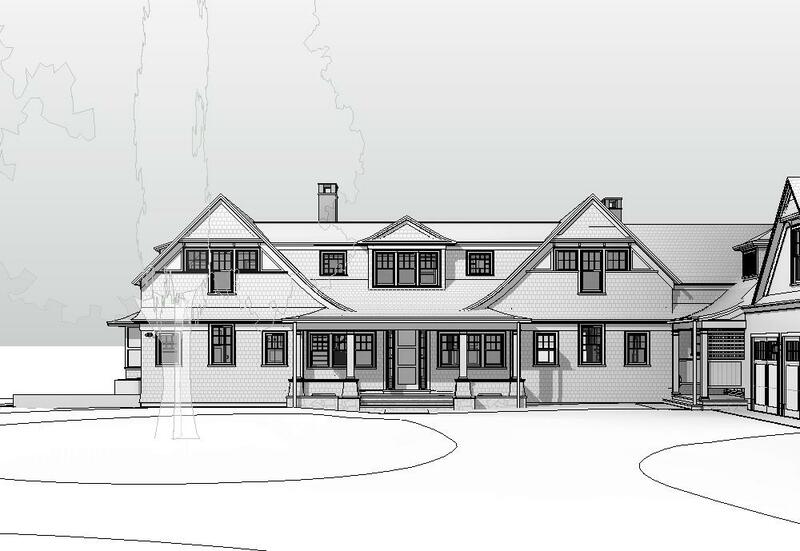 Concord Academy Bradford House broke ground earlier this month as part of residential life enhancements outlined in The Centennial Plan for Concord Academy. We look forward to sharing updates as the project continues through the late summer of 2018. DSK is excited to receive an NAHB Best In American Living Award for Inside Out! 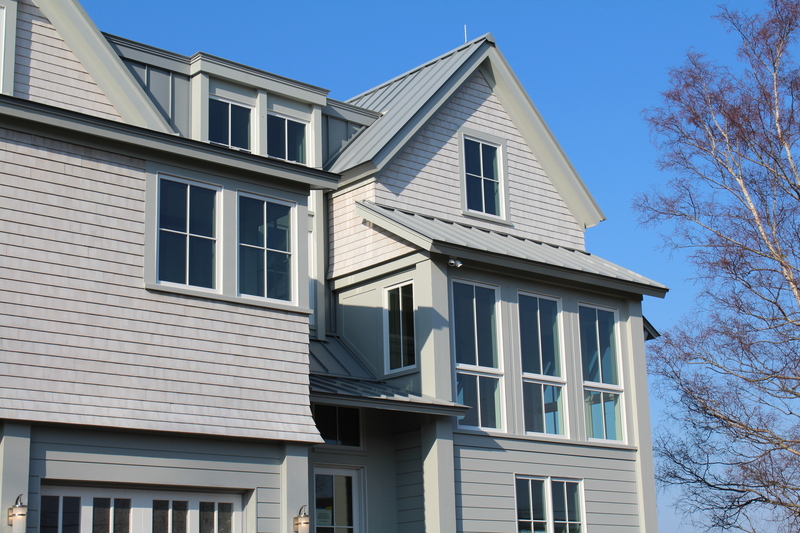 Click here to see photos of this custom residential house. 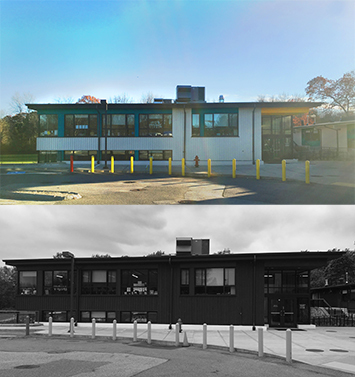 Nashoba Brooks School has been transformed through a new exterior color palette developed by DSK. Through an office-wide design braintrust, a proposal emerged to establish a new field color with mid-twentieth century modern accent colors. The fresh and expressive design scheme cohesively ties the campus together, reflects the buzzing air of innovation within, and breathes new life into Nashoba’s exterior experience. DSK recently celebrated breaking ground on construction of Concord Market, a new high-end market set to open in Concord center in 2018. 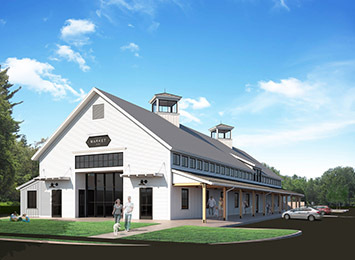 Concord Market will offer quality meats, homemade prepared food, a full in-house bakery, wine, craft beer, and more. Construction of a new parking deck is also currently underway on site. Check back for project updates. We’re honored to receive Boston Magazine’s 2017 Best of Boston award for Best Architect, New Construction, West. This follows our recognition earlier this year by Boston Home Magazine as a 2017 Best of Boston award winner. 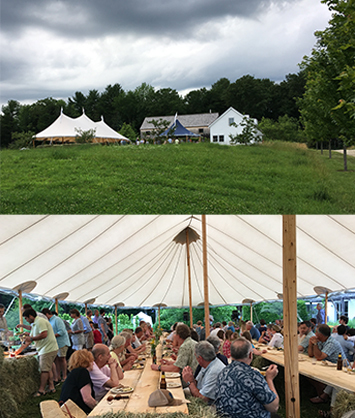 I was fortunate to attend the 25th anniversary celebration of the office of Stephen Stimson Associates (SSA) landscape architects held at Charbrook Farm in Princeton, MA on Saturday July 8th. The various remarks that were presented underscored the quality of SSAs design work and the strength of their collaboration with others. 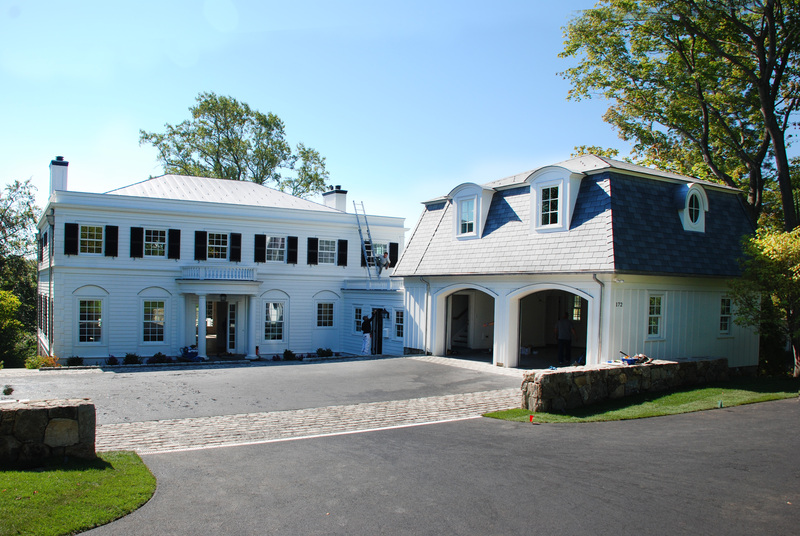 The design of various buildings at Charbrook was the result of a collaboration between DSK and Steve and Lauren Stimson. 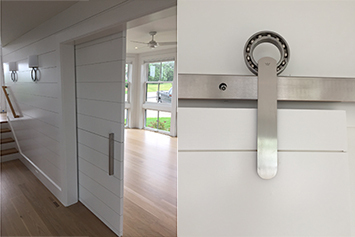 DSK’s almost finished Orleans, MA project has a recently installed, beautiful shiplap barn door between the main house and the multi-season room. 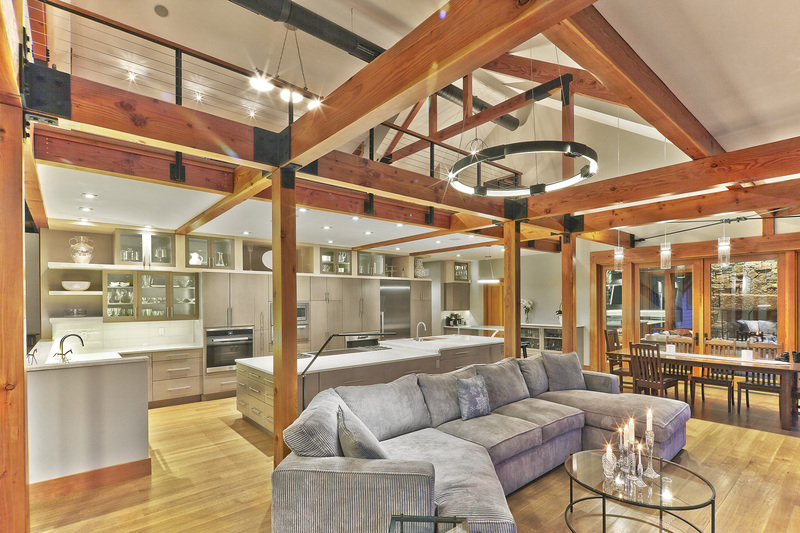 The DSK team is attentive to all details of a project from the selection of the barn door track to the layout and flow of an entire floor plan. Look closely at the image above, the lines of the shiplap on the door and the wall align perfectly and this subtle reveal detail appears again between the stair tread and riser. 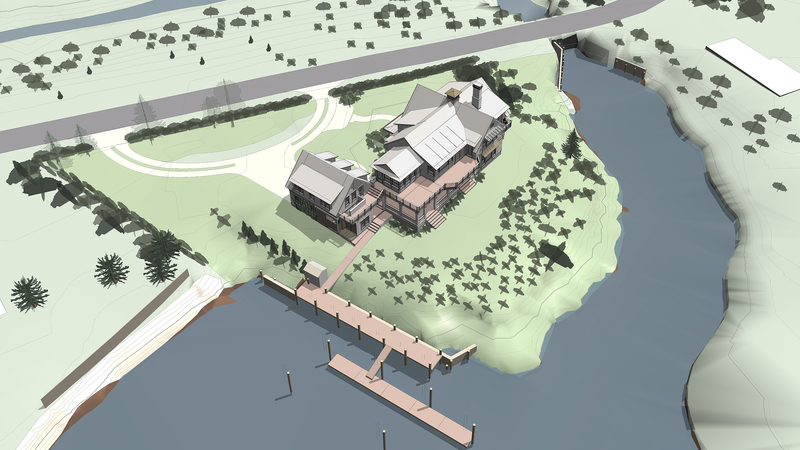 Look out for more updates on this project and an even closer look at the design details throughout this custom home. DSK recently had the exciting opportunity to spend a day visiting some of Harvard University’s microscopy imaging facilities. Joined by the Marine Biological Laboratory (MBL), DSK toured multiple imaging facilities, specializing in areas from biology to neuroscience. The tour was catalyzed by the MBL’s ongoing design engagement with DSK. Highlights of the Harvard tour include getting to see the ZEISS MultiSEM 505 – the world’s fastest scanning electron microscope! Tom Kearns, President + Principal at DSK, has been elevated to the AIA College of Fellows as part of the class of 2017. Becoming a Fellow is the AIA’s highest membership honor, recognizing significant contributions to the profession. About 3% of the the AIA’s 88,000+ members have this distinction. The results of winter and spring photo shoots are here. Click through the image above and the link below to see more photos of the Half-Pass house in Carlisle, MA. More photos and a description of the project here: Half-Pass. “It is wonderful to see all of the changes happening in our sweet little village of Padanaram. 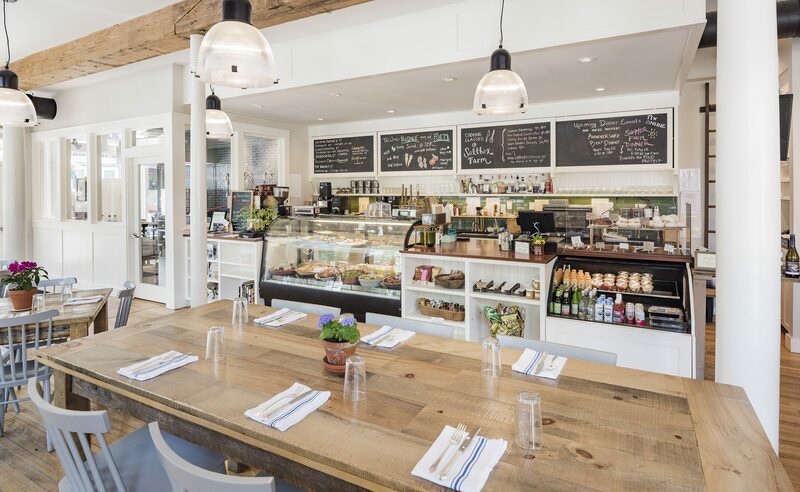 Take a peek here to read a great article about a favorite restaurant of ours, Little Moss, that opened this past summer. Keep an eye out for more updates on the Bridge Street Marketplace and click through the links to see more photos of Little Moss. Keep an eye out for updates to two recently completed residential projects. Both the Colonel Willie Cove and Stage Harbor houses make the most of challenging but beautiful sites. 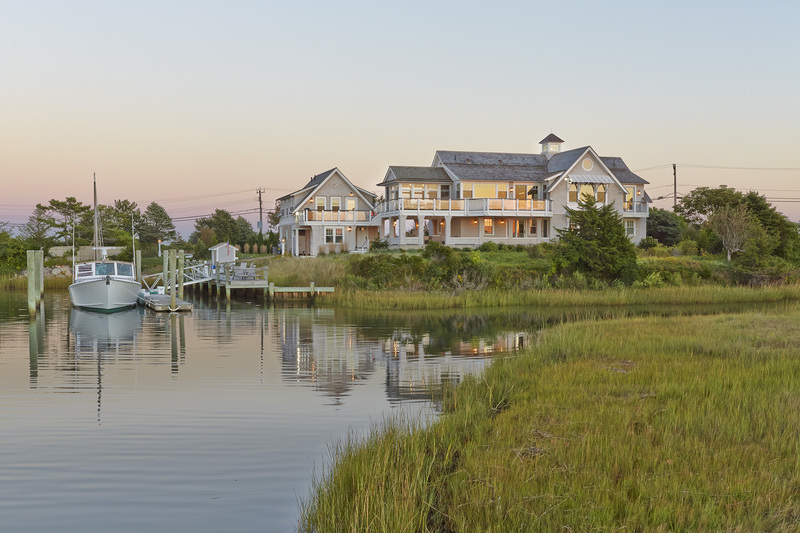 Built on previously developed land in coastal flood zones, complex foundation systems were constructed to enable siting that makes the most of incredible ocean views. The two buildings are “upside-down” houses with the main living spaces on the second floors. More to come on the creative technical solutions used to make these homes a reality. 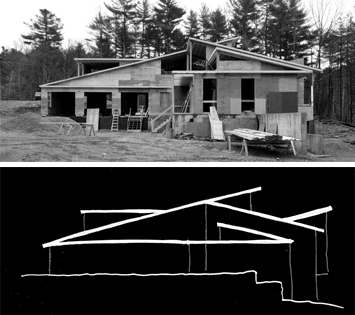 The top photograph is a 3D-printed model of Musketaquid, a new home currently under construction here in Concord, MA. The bottom photograph is an image of the Revit model used to create both the 3D-print as well as generate full construction drawings. In order to balance the contemporary first floor space demands of the client with the more petite historic scale of nearby homes, the roof and eave line are set closer to the ground. The first floor is a series of interconnected open spaces, including a master suite oriented to maximize afternoon daylight on the southwest corner. The second floor spaces are characterful, garret-like spaces shaped by the low bearing roof and by dormers that provide light as well as more ceiling height. After negotiating a ledge-filled site, foundation work began in earnest about a month ago. We look forward to sharing more on this project as construction and design progress. DSK staff took part in a pre-Thanksgiving outing to Merrimack College in North Andover, MA. DSK has been working with Merrimack College for the past 2 1/2 years, providing planning, architecture, and interior design services at a variety of scales. Our work is a comprehensive blend of resolving immediate space needs while also supporting near and long term innovation initiatives. 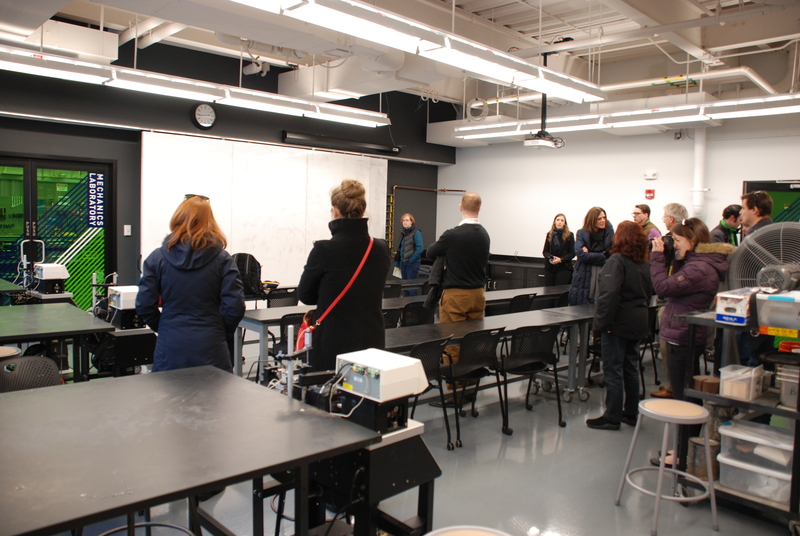 The tour was led by both Merrimack and DSK staff, walking through a selection of interior renovation projects ranging from the President’s Suite to Division I Hockey Locker Rooms. 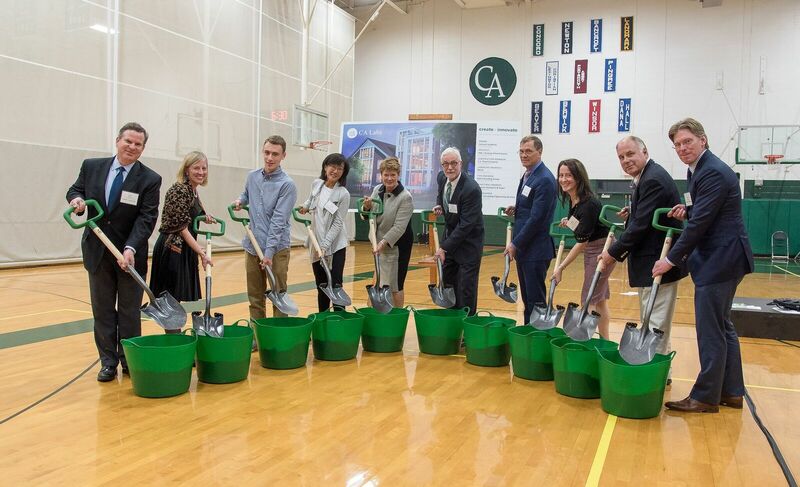 Despite a rainy day, the groundbreaking for the Concord Academy Science Center (aka CA Labs) took place this fall. We look forward to sharing the progress of this project as construction is now fully underway. 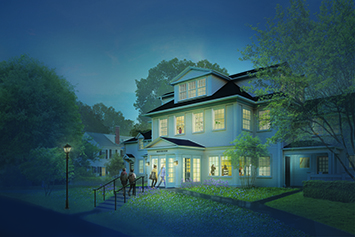 DSK worked collaboratively with Concord Academy, our neighbor right up Main Street from the Concord office, to design a kick-off capital project that would best represent the goals of create + innovate: The Centennial Plan for Concord Academy. See more information on the groundbreaking and create + innovate here. Follow us on social media. Search #studioDSK on Instagram and Twitter to see more of our work. Click here to visit the DSK Twitter feed. Click here to see #studioDSK photos on Instagram. We’re in the midst of reviewing photos from last months Stage Harbor photo shoot in Chatham, MA. Stay tuned for the full project update. 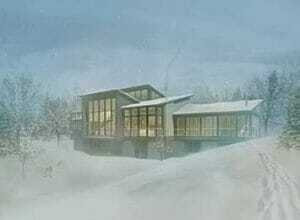 Click through the image to the project page to see some of the drawings and images used to design and build this home. Thanks to Chuck Mayer for some fantastic shots. While doing some overseas travelling, DSK’s Tom Kearns took the opportunity to visit Foster + Partners in London. 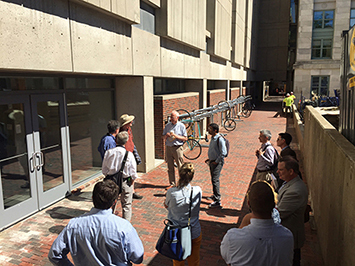 DSK staff attended a lecture last Thursday by Lord Norman Foster on the ongoing green movement held at GSD’s Gund Hall in Cambridge, MA by the Harvard Center for Green Buildings and Cities. 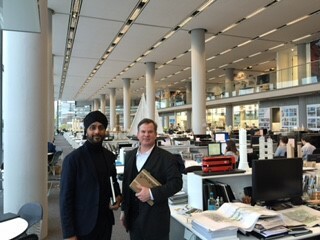 In the photo, Foster partner Narinder Sagoo and DSK’s Tom Kearns in Foster + Partner’s main studio space. Thanks to Foster + Partners for the invitation. 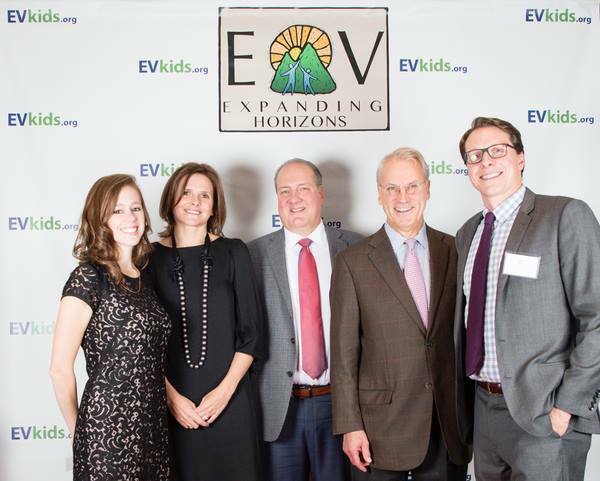 DSK staff attended the Earthen Vessel’s 35th Anniversary Gala at the Charles Hotel in Cambridge, MA. We are pleased to be a part of this fundraising event. 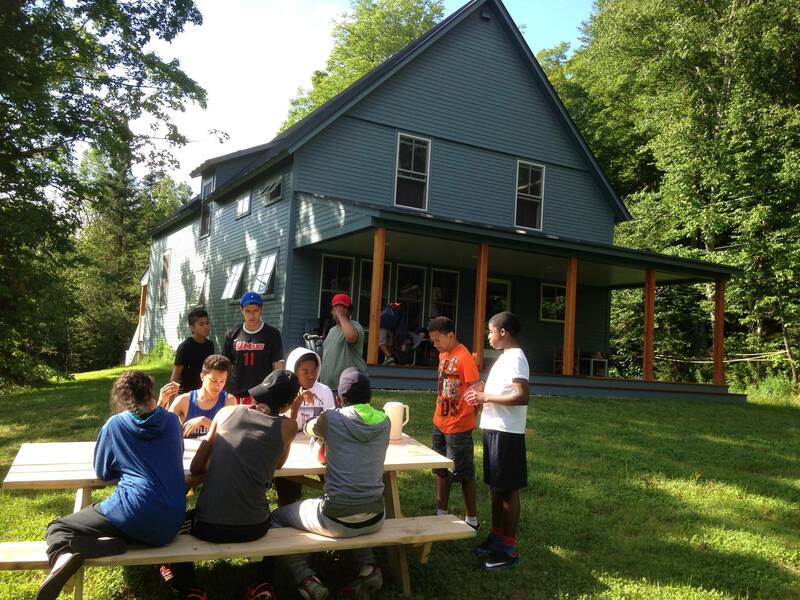 Earthen Vessels empowers inner city youth through one-on-one mentoring programs as well as an immersive summer camp in the Green Mountains of Vermont. 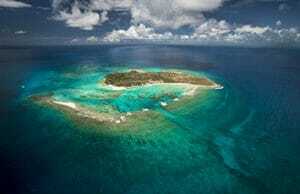 See more on EV Camp here and more on the Earthen Vessels mission here. 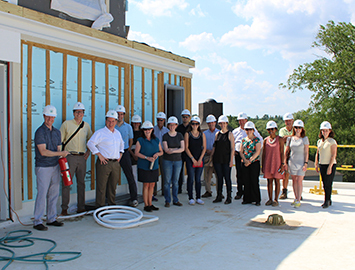 Summer Star named the USGBC MA Chapter 2015 Green Building of the Year. See link below for more a look at the Green Building Showcase, held at the LEED Gold Harvard Art Museum. 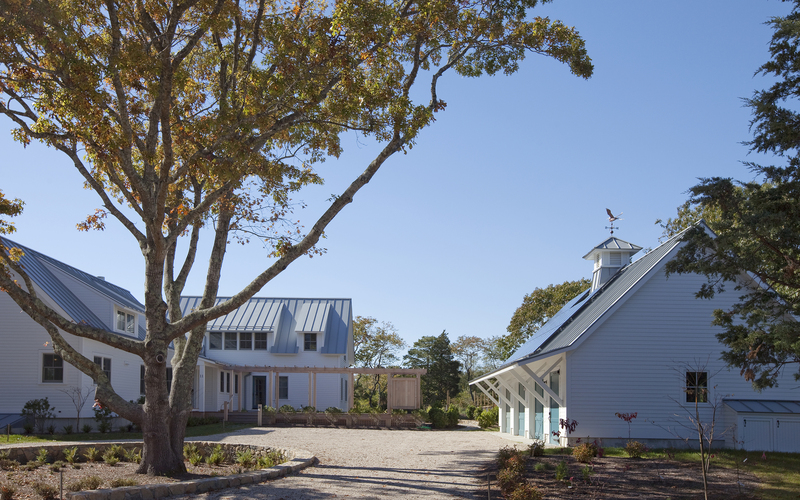 DSK and Silver Maple Construction recently completed the new farmhouse for Earthen Vessels Camp. 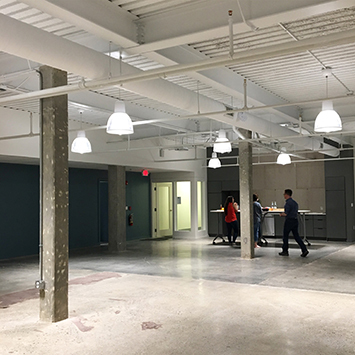 Photo of the renovated kitchen and communal gathering space above. More details in the article below. DSK is delighted to see the final details come together on our most recent new residential project in the Greater Boston area. The Highland House project had a 14 month timeline requiring great execution by all team members involved. DSK named Tom Kearns president of the firm. Tom joins founders Allen (Chip) Dewing and Mark Schmid on the firm’s Board of Directors. 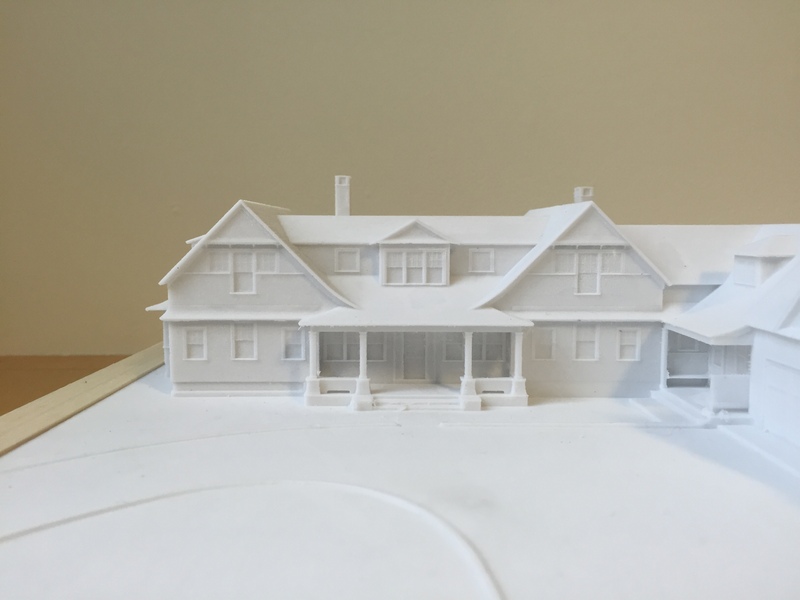 DSK led a well attended charrette for citizens of the town of Bedford, MA to explore the best use for a five-acre plot of former Coast Guard homes. Click through the link to see more on Edgewood. 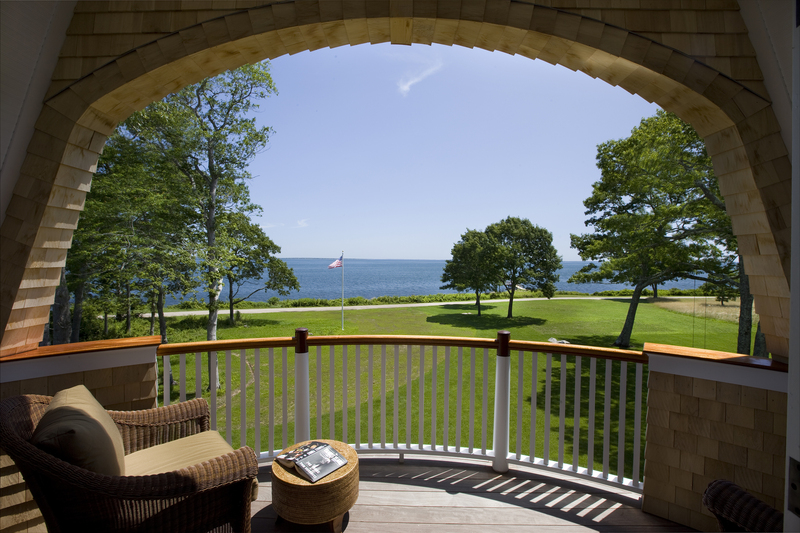 Click through the link to see more on Bay View. Click through the link to see more on Three Little Houses.